We all know that fruit and veg is good for us. But some new research from the University of Reading has revealed there is more than meets the eye with the little blue super fruits we call blueberries. These berries, which are full of a type of nutrient called flavonoids, were shown in two separate studies to improve the positive mood of children and young adults just two hours after consumption. The two studies, which were conducted by the University’s School of Psychology and Clinical Language Science’s Nutritional Psychology Lab, were run in two populations – healthy young adults aged 18-21, and healthy schoolchildren aged 7-10. 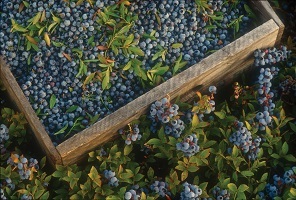 After consumption of a flavonoid-rich blueberry drink, both groups rated their positive mood as being significantly higher than before the blueberry drink consumption. What’s more, we know it was the flavonoids present in the blueberry drink that made the difference, because no such finding was observed in a group of study participants who consumed a placebo control drink, which was matched for sugars, vitamins and taste. So how are these flavonoids working? Previous research conducted by the University of Reading discovered short-term improvements in attention and memory after consumption of a blueberry drink in adults and children. It may be these improvements in attention which are mediating positive mood effects, via increased blood flow to the brain. These studies demonstrate how including flavonoid-rich foods as part of a healthy, balanced diet might play a key role in promoting positive mood and potentially preventing low mood. If you don’t like blueberries, all is not lost. Flavonoids are found in many fruits and vegetables, so such an effect has positive implications for improving public health. Further research will be needed, but this could be a simple way that we might improve health and well-being throughout brain development in childhood and into adulthood.